Is a mouthful of metal actually a better option over crooked, misaligned teeth? What if you could avoid both? The experienced team at Wall St Dental Spa in the Financial District of New York City offers Invisalign® teeth alignment treatments. If you want to straighten out your smile without the inconvenience of braces, call Wall St Dental Spa or book an appointment online today. Invisalign provides an attractive alternative to traditional orthodontic treatments like braces. It’s a revolutionary new way to straighten teeth. This treatment uses clear, plastic aligners that fit over your teeth to gradually align them over time. It’s best to wear the aligners for at least 20 hours per day, but they can be removed for easy eating and teeth cleaning. Wear the Invisalign aligners any time you are not eating, drinking, or brushing your teeth. For major alignment and orthodontic issues, a different treatment may be recommended by your dentist. To see whether Invisalign is the best option for you, visit Wall St Dental Spa for a consultation. Your dentist will first examine your teeth to determine whether Invisalign is the best treatment method for you. To fully examine your teeth, they will need to either create a physical impression of them or digitally scan them into 3D images. Your dentist will use these to develop a unique treatment plan for you. After this step, your dentist will customize plastic aligners to fit over your teeth. As you wear them, the aligners smoothly shift your teeth into perfect alignment. 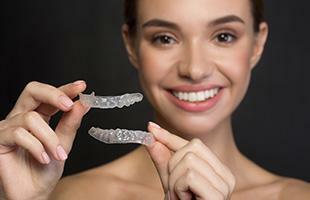 As your teeth move, new aligners may be made to continue progress. At the end of this process, your smile will have its new shape! If you want to straighten your teeth without unsightly, painful braces, talk to the team about Invisalign by calling Wall St Dental Spa or booking an appointment online today.